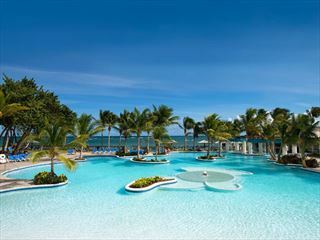 The breath-taking surrounds of the Caribbean coastline really set the Anse Chastanet hotel apart. 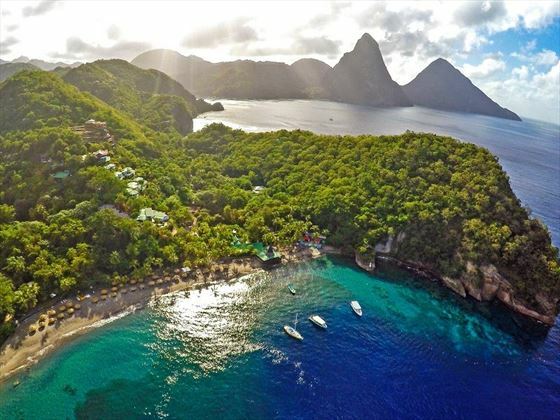 Boasting an innovative design that sees the hotel blend with over 600 acres of tropical landscape, you’ll be met with some of the most spectacular views of St Lucia. We love the way the accommodation blends into the impressive scenery, from rooms which are open to the views yet remain secluded, to the rooms built around vast red gommier tress. 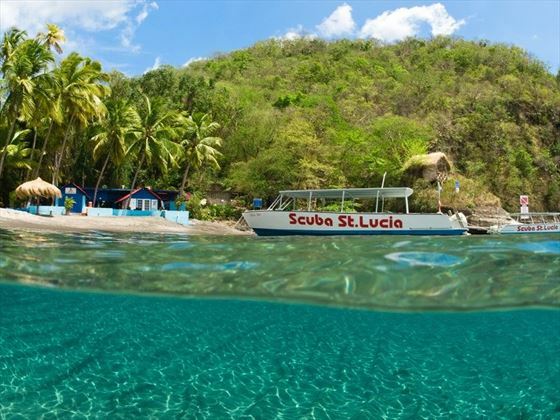 There’s plenty to explore here – the tropical flora and fauna set a stunning backdrop for hiking, cycling or scuba diving. 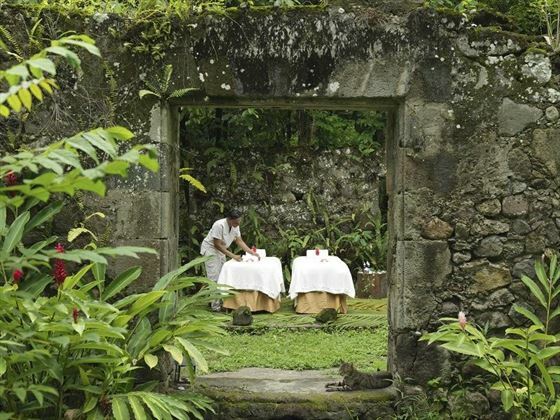 Fancy a unique dining experience? 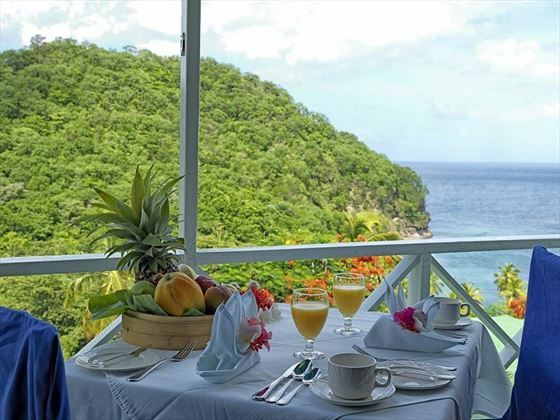 Head to one of the open-air tree houses with overlook the sea and offer Caribbean cooking with a difference. If you’re craving something different, the diverse range of Creole, Indian and international flavors should fit the bill. 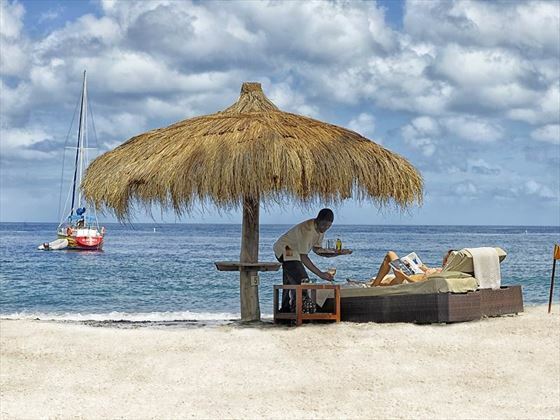 You can’t enjoy your stay here without a visit to the Kai Belte spa, complete with nail salons and an open-air cabana which overlooks the reef. 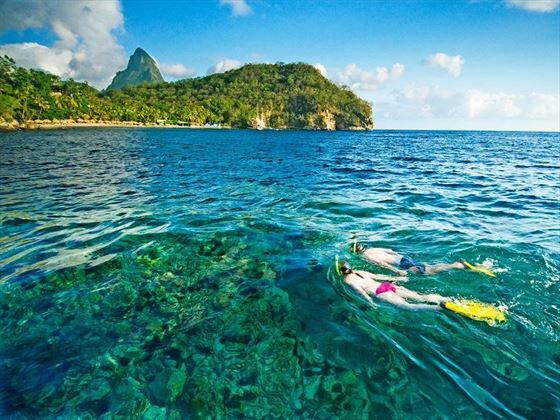 Thanks to its sheltered location Anse Chastanet is very peaceful, so it makes a great choice for a couple’s vacation. 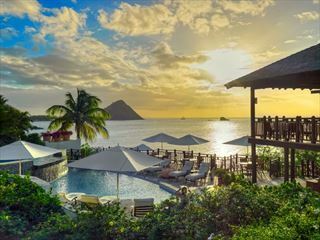 Top tip: Explore the St Lucian coastline on the hotel’s sunset cruise, where you can sip champagne and take in the sights to the sounds of live jazz music. 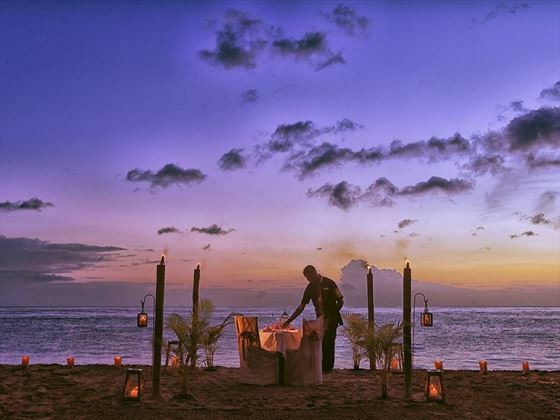 The hotel offers 49 individually designed rooms, 37 of which are dotted around the hillside and 12 of which are located within the tropical garden at beach level. 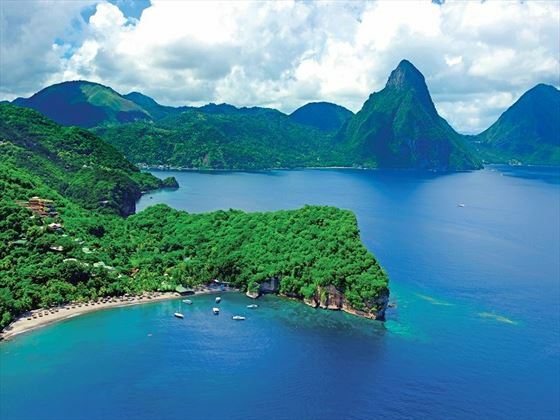 Standard and Superior Hillside – Superior rooms feature two twin beds or one king-size bed, with ocean and/or Piton views. 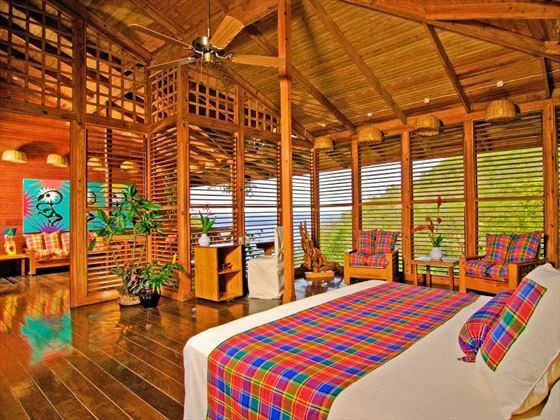 Standard rooms are slightly smaller than Superior rooms with twin, queen or king-size bedding, and garden or partial ocean views. 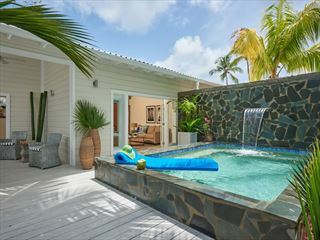 Deluxe Beachside – These rooms are spacious with two doubles or one king-size bed, en-suite bathroom with two sinks, shower and toilet. 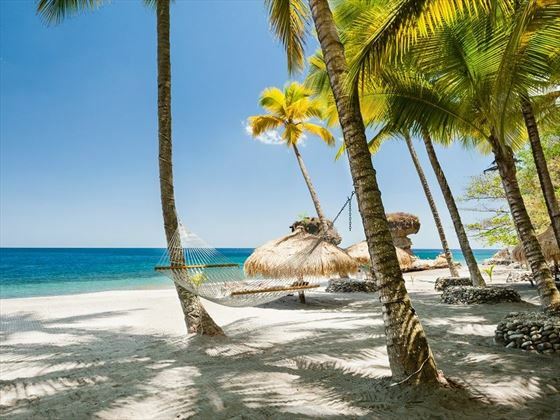 All beachside rooms offer a tropical garden view and are located just a few feet from the water’s edge. 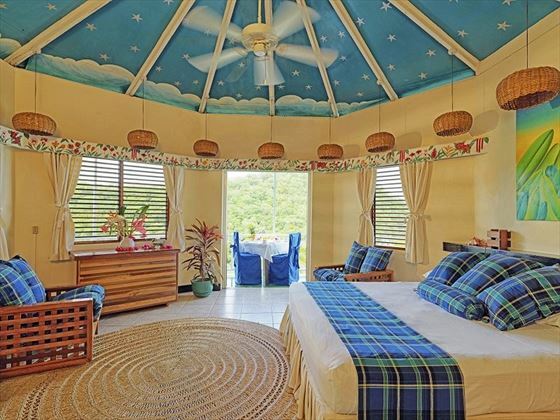 Hillside Deluxe – These rooms are extremely spacious and individually designed, some with the fourth wall missing or a dramatic open roof dormer to provide an open-air style. Some rooms have a formal separation between the bedroom and living room – others have wide open spaces flowing into each other. 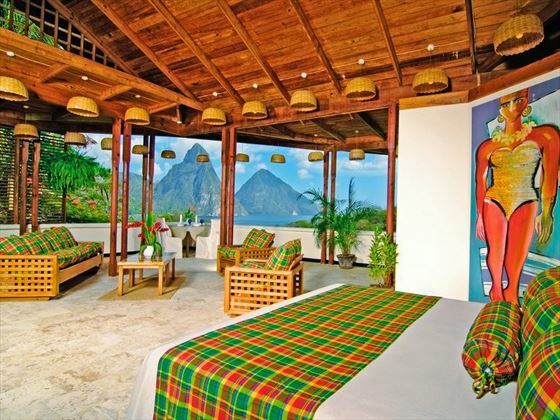 Premium Hillside – These rooms offer picturesque views of the Piton Mountains and the surrounding sea, thanks to the elevated position they occupy.